XRP/USD went down from $0.319 to $0.318 as markets opened this Tuesday. Immediate support level lies from $0.317-$0.318. If that doesn’t hold up, the price can go down to $0.313. XRP/USD went down from $0.319 to $0.318 as markets opened this Tuesday. According to the daily confluence detector, the price is supported by a stack which runs from $0.317-$0.318. 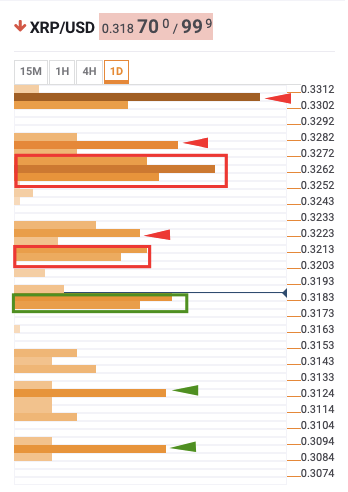 If the bears can breach past that level, then the price will drop down to $0.313 before it meets the next prominent support level. $0.32-$0.3215: 10-day simple moving average (SMA 10), SMA 100, 4-hour Bollinger band lower curve, and daily 38.2% Fibonacci retracement level. $0.325-$0.327: SMA 200, SMA 100, SMA 5, daily 61.8% Fibonacci retracement level, SMA 50, SMA 10, and 4-hour Bollinger band middle curve. $0.331: Monthly pivot point resistance 1 and weekly 23.6% Fibonacci retracement level. $0.317-$0.318: Hourly previous low, SMA 10, daily 23.6% Fibonacci retracement level, 15-min Bollinger band middle curve, SMA 5, and previous low. $0.313: Monthly 61.8% Fibonacci retracement level.